In a great stride toward finding an effective treatment for early-stage neurodegenerative diseases, UC Santa Barbara neurobiologist Kenneth S. Kosik and collaborators have uncovered a “druggable” mechanism of pathological tau protein aggregation. For the millions of people at risk for frontotemporal dementia and a host of other such conditions including Alzheimer's, this could signal a shift toward significant management of symptoms or outright prevention of some of our most devastating diseases. “We’re super excited about this,” said Kosik, the UCSB Harriman Professor of Neuroscience and co-director of the campus’s Neuroscience Research Institute. While there is much more work to be done, promising evidence for this treatable mechanism is mounting and the stage is set for future investigations. 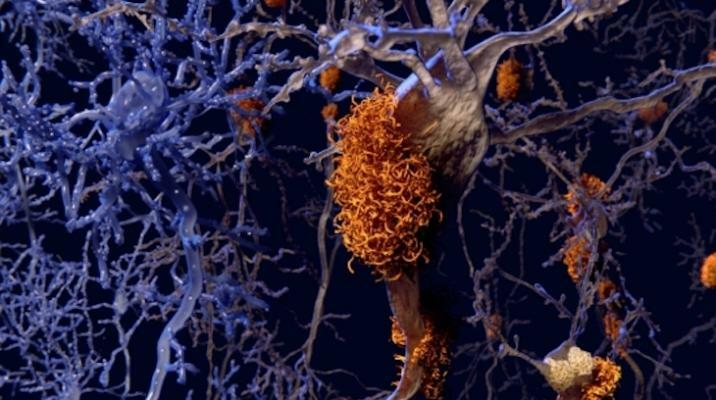 In the wake of the recent halting of clinical trials for Aducanumab, a drug that once looked to be a promising Alzheimer’s treatment, this development signals a ray of hope. The team’s paper, “A Farnesyl Transferase Inhibitor that Targets Rhes Reduces Tau Pathology in Mice with Tauopathy,” is published in the journal Science Translational Medicine. Tau, a protein found primarily in neurons, is typically a somewhat innocuous, very soluble protein that stabilizes microtubules in the axon — the part of the neuron that conducts signal to other neurons. “People think of it as the ties on railroad tracks holding the microtubule tracks together,” Kosik said. However, when soluble, stable tau misfolds — sometimes the result of a mutation of the gene that expresses it — the resulting protein becomes insoluble and tangled, gumming up the works inside the neuron as a neurofibrillary tangle. In one of several neurodegenerative diseases caused by tau, frontotemporal dementia, the frontal and temporal lobes of the brain are impaired, resulting in problems with emotion, behavior and decision-making. “Patients do not initially show very many, if any memory problems in this condition,” Kosik said. “They tend to show more psychiatric problems, often with impulsive personalities in which they show inappropriate behaviors.” Other forms in this group of conditions affect language and motor skills. By taking skin cell samples from a few individuals who harbor tau mutations and converting them in vitro into stem cells, and then into neurons, the researchers found that three genes were consistently disregulated in those with tau mutations, one of which was of particular interest: RASD2 — a gene expressed primarily in the brain that belongs in a family that catalyzes energy-producing molecules (GTPases) and which has been studied extensively. “People had already talked about this gene as possibly involved in Huntington’s disease, which is another neurodegenerative disease,” Kosik said. RASD2 and its more famous cousin RAS (studied heavily in cancer research) are considered “druggable,” Kosik explained. “There are drugs or potential drugs or small molecules that are out there that could affect the levels of this gene,” he said. If you’re a neuroscientist interested in tau mutations and cures for the conditions they create, you know you’re in for a long game. The nature of these diseases — genetic and neurological — means that advanced studies must be highly controlled and are often extremely difficult and expensive to come by and any drugs developed must be both effective and relatively nontoxic. Such has been the case for Kosik and the paper’s lead author, postdoctoral researcher Israel Hernandez, who have for years been studying tau tangles and the protein coding genes that could contribute to or counteract tau misfolding. Kosik, Hernandez and their colleagues’ combination of expertise and curiosity led them to examine a GTPase called Rhes, which is encoded by the gene RASD2 and has been shown to play a role in the development of Huntington’s disease. However, it wasn’t Rhes’s catalytic activity that piqued their interest. “We quickly realized the obvious function of the Rhes protein — its enzyme activity — was not critical to what we were looking for,” Kosik said. “What we ended up focusing on was the fact that this protein and all members of its family are attached to the cell membrane in a very interesting way,” he continued. Like its cousins in the Ras superfamily, Rhes is a signaling protein that does its work on the cell surface, where, Kosik explained, it is attached to the inner membrane by a small carbon chain — a farnesyl group — through a process called farnesylation. This attachment has been the target of a couple decades and millions of dollars of cancer research under the assumption that if the Ras protein connection to the cell membrane could be interrupted, so would the signals that cause unregulated growth of tumor cells and other cancer behaviors. In mice models with frontotemporal dementia, however, it seems they do. And the results are dramatic. Using the drug Lonafarnib, the researchers treated mice who at 10 weeks were erratic — running around in circles or completely apathetic — and by 20 weeks they were sniffing around their cage or nest building and doing other normal mouse behaviors. Scans revealed the arrest of brain tissue deterioration and inflammation. Most dramatic: The once-insoluble neurofibrillary tangles were greatly reduced, and in some areas including the hippocampus — the memory part of the brain — were nearly completely gone. “The drug is very interesting,” Kosik said, “It seems to have a selective effect on only the forms of tau that are predisposed to forming the neurofibrillary tangles.” To prove the drug was targeting the farnsylated Rhes protein, the scientists introduced into the brains of other mouse models an inhibitory RNA gene that specifically suppresses the production of Rhes. And the results completely replicated the effects of the drug. The publication of this paper represents a milestone in the researchers’ years-long effort to gain ground on the uphill battle that is tauopathic neurodegeneration. As if grueling research wasn’t enough, along the way they have had to search the globe to get the sign-off from a team member who was literally heading uphill — at Mt. Everest. Hernandez, meanwhile, celebrated the birth of his first child on the day the paper was accepted. But the race isn’t over yet. Now the stage is set for human trials, with a few volunteers at risk for the disease. And perhaps further down the road, the team is considering a population with frontotemporal dementia in Colombia where Kosik has conducted similar studies in Alzheimer’s disease. But even that early stage may be in limbo, as the makers of Lonafarnib, currently in trials for the drug as a treatment for progeria, are reluctant to involve their product in new trials before they get their approvals. Kosik and his team are pondering their options as they contemplate a potential long-awaited solution to a group of heartbreaking — and wallet-draining — neurodegenerative diseases. Research on this study was also conducted by Gabriel Luna, Jennifer N. Rauch, Michael Giroux, Daniel Boctor, Youssef E. Sibih, Alexander A. Kang, Cassidy Hinman, Vesna Cerovac, Elmer Guzman, Honjun Zhou and Steven K. Fisher of UC Santa Barbara; as well as by Surya A. Reis and Stephen J. Haggarty of Harvard Medical School. Nadia J. Storm, Antonio Diaz and Ana M. Cuervo at the Albert Einstein College of Medicine also contributed research, as did Celeste M. Karch from Washington University; Cezary Zekanowski from Polish Academy of Sciences; and Alison Goate from Icahn School of Medicine at Mount Sinai. Any new treatment for M S? I've read some forms of frontotemporal dementia will cause movement problems similar to Parkinson's and ALS - though I don't know if they're the same. I also wonder if some kind of tau folding screen could be developed to help people anticipate (with some uncertainty of course) that they could be facing a neurodegenerative disorder down the line. That might give people time to prepare in whichever way they see fit. But if you live in the US, I wouldn't want insurance companies to catch wind of positive screen results. Wow, very exciting! Congrats to Hernandez, Kosik, and their collaborators. And very fortunate that a farnesyltransferase inhibitor is already in trials (albeit for a very different application - progeria). I hope Eiger Biopharmaceuticals in Palo Alto (and their investors) come to some kind of agreement to open the door to trials of Lonafarnib for neurodegenerative disorders.